Showcasing one of a kind blazers from the website! Blazers always inspire me when I’m putting together outfits! What I enjoy about styling blazers is that they’re very versatile when it comes to pairing with other pieces. When blazer searching for MTYA, I always enjoy finding blazers that have a unique pattern (whether stripes or polka dots), internal shoulder pads, either full length or quarter length sleeves, and blazers with a unique collar. The Cotton Candy Striped Blazer. 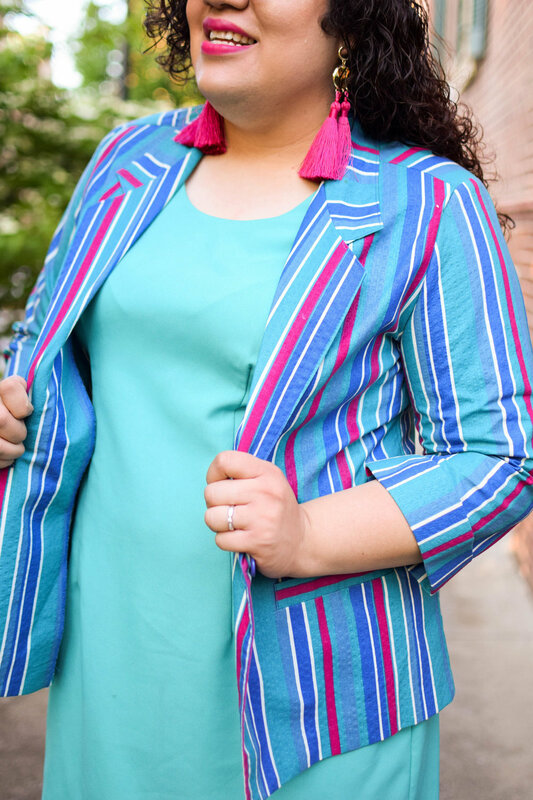 When I found this Cotton Candy Striped Blazer , I remember feeling extremely happy because of its detailed stripes and bold colors. I really enjoy how the bold pink stands alone with the various shades of blues. In addition to the color combination, I really enjoy how the stripes are highlighted on the collar and 3/4 quarter sleeves. In styling, I decided to pair this blazer with a solid turquoise dress. As you will see, the same color turquoise represented in the blazer is also the same color of the dress. For additional ways of styling, consider pairing this blazer with another solid colored dress such as white, another shade of blue, and a shade of pink. The Multi-Colored Fun Patterned Jacket is one of my favorite blazers options that can also be styled as a jacket on the website. It’s hand stitched detailed, rainbow shades of block colors, unique buttons, and external pockets speak volumes when it comes to this piece. 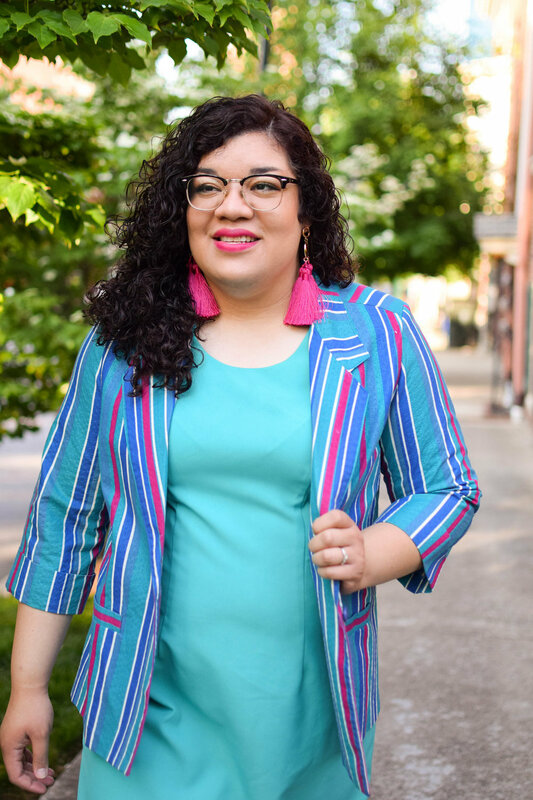 What I also enjoy about this piece, is that you can have fun with pairing this blazer with either a solid colored blouse (as pictured) or with another fun pattern such as stripes or polk dots. For additional ways of styling, consider pairing this blazer with another solid colored blouse such as bold pink, yellow, or blue. Even consider pairing different colored accessories like I’ve done with this necklace. The Black and White Polka Dot Blazer. Aside from stripes, polka dots are one of my favorite patterns! I enjoy wearing polka dot blazers, skirts, blouses, slacks, and accessories. When it comes to this polka dot blazer, I really like how the white serves as the foundation of the black polka dots sprinkled throughout. The cut of this blazer is very detailed and overall this selection is very light for pairing other pieces underneath such as blouse (as pictured). Since this blazer doesn’t come with a bold collar, I decided to pair a blouse underneath and style the collar of the blouse over the blazer. For additional ways of styling, consider pairing this blazer with other colors underneath such as mustard yellow, emerald green, or black. The Multi-Colored Full Length Plaid Blazer. 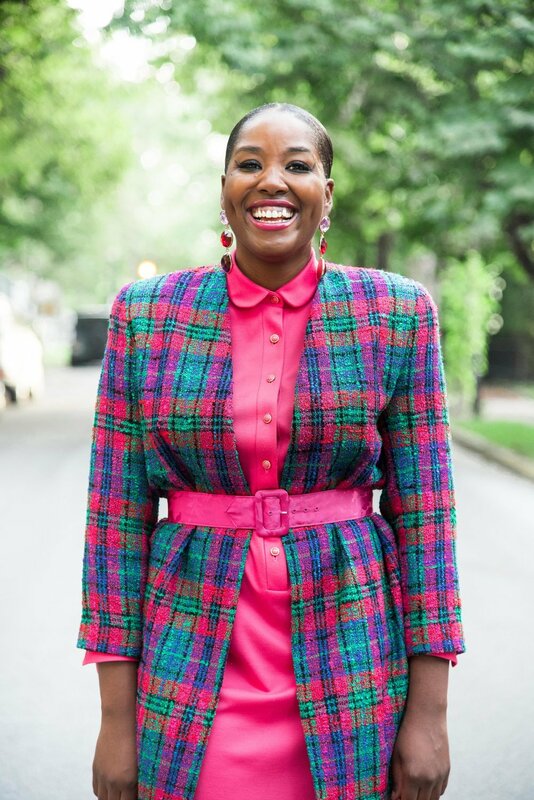 Finding a full-length blazer like this Multi-Colored Full Length Plaid Blazer can be extremely difficult at times, especially when you’re searching for one with just as much, if not more boldness and personality. From bold pink to emerald green, there are a rainbow of colors represented throughout this blazer. What I also enjoy about this piece, is the plaid detail lining that is represented along the lining and sleeves. While this blazer doesn’t come with any collar detail, I’ve paired a solid colored dress with collar detail underneath. Additionally, I’ve also paired a bold pink belt over the blazer. For more styling methods, consider pairing this blazer with another solid color such as purple, emerald green, or another shade of pink. I always love selecting finds for MTYA with plenty of embroidered detail like this blazer! From the detailed pockets to the bold buttons, this linen blazer will definitely catch anyone’s attention. What I enjoy most about this piece, is how linen of this blazer can be worn throughout a majority of the seasons. From Spring to Summer, this blazer is light enough to be paired with a sleeveless top. In styling this outfit, I decided to pair this blazer with a light casual striped top. For additional styling methods, consider pairing this blazer with another pattern such as polka dots, or a solid white/colored blouse. Did you enjoy this week’s MTYA favorites: Blazer Edition? Remember to shop them directly for 20% OFF by clicking on the photos or the links in each description. Enter promocode: WEEKLYFAV to receive this week’s discount. SHOP THEM NOW! Why I Love Turtlenecks and Giving You Tips on Styling Them!